A popular YouTube prankster has admitted staging footage that cast opponents of Donald Trump in a bad light. A car covered with Trump stickers is left in a mostly African-American neighbourhood. Within minutes a group of young black men are on the scene. They surround the car and smash its windows. 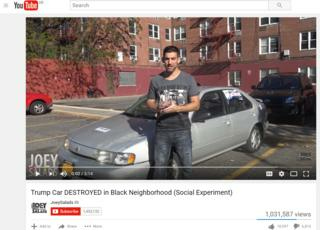 That's the setup of a video by prankster Joey Salads which was posted on Monday and quickly racked up more than 1 million views. It subsequently featured as a lead story on the Drudge Report and other conservative news sites. "You may have seen on the internet and through the polls, that a lot of black people don't like Trump. They don't even like his supporters in some cases," Joey Salads, whose real name is Joe Saladino, says to the camera. "As you can see from this video, the black community is very violent towards Trump and his supporters." But as it turns out, the smash up was staged. Salads was forced to admit to the fakery after footage was posted showing the men who appeared in the video standing behind the camera and clearly involved in the production, rather than spontaneously coming across the car. The hoax was uncovered by another popular YouTube vlogger, Mark Dice. Dice, himself a Trump supporter, called the video "shameful" and posted a video response of his own including the behind-the-scenes footage. "There's definitely some serious tension in the country between the races right now and this adds some phoney fuel to the fire," Dice told BBC Trending. "It makes the black community look bad and it enrages Trump supporters by making them think there is another instance of violence directed at them." Dice says he was concerned the video would deflect attention from authentic attacks directed at Trump supporters, and cited the firebombing of a Republican office in North Carolina and other reports of vandalism. This week a Democratic operative was caught on video allegedly suggesting methods of inciting violence at Trump rallies. On Tuesday Saladino came clean, telling Trending: "I regret the direction I took with the video." "I basically edited the video to make it look like something else happened that was not true," he says. He says he asked the men in the video to smash up the car, although he didn't know them before the filming. In a video confessing to the hoax, he said he'd set out to test whether people would stop the men from destroying the car. He claims that people in nearby houses egged the men on, which was the reaction he intended to provoke, and yet realised when editing the video he could make a much stronger - and deceptive - point. "I thought I could have got away with it, but I didn't," he says. "I screwed up when it came to this one." Joey Salads is not a stranger to questions about the reality of his gonzo videos. Last year Trending questioned whether one of his "social experiment" videos about child abduction was unnecessarily scaring parents. He's previously made videos where he appears to get abuse from Bernie Sanders supporters and tried to encourage anti-Trump protesters to stomp on an American flag in a "prank gone wrong." He's promised to post further election-related videos that, he says, "can't be faked."